In sun or shade - the first and last to bloom. DeZire is a cracking new Busy Lizzie that will light up your garden with an incredible show of colour. Flowering from early summer right through to autumn it is perfect for beds, borders and patio pots. Containing shades of pinks, reds, scarlets and whites. Supplied as a pack of 20 Garden Ready Plants. 'DeZire' is a cracking new Busy Lizzie that will light up your garden with an incredible show of vibrant pinks, reds, scarlets and whites. Flowering from early summer right through to autumn, it forms a compact, uniform habit that is perfect for beds, borders, window boxes and patio pots. 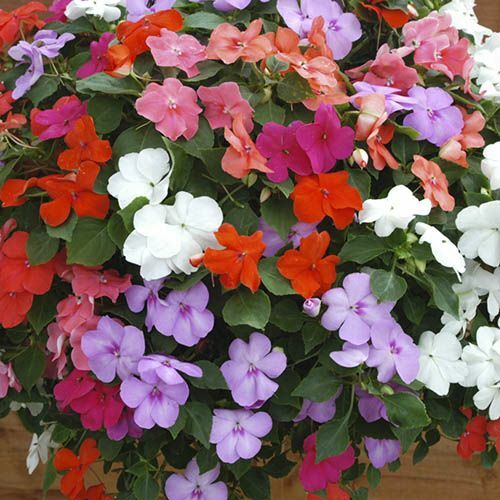 To lessen the chances of problems with Impatiens Mildew, follow good hygiene precautions, and use new or sterilised pots and planters, use new compost, and avoid replanting in places where there have been problems in the past. Supplied as 20 Garden Ready Plants for you to either pot up or plant straight out after all risk of frost has passed.